Preheat the oven to 350° F. In a large bowl, whisk together the condensed milk and sour cream. Once smooth, add the lime juice. Whisk until smooth and thickened. Pour into the prepared pie crust. Bake for 6 to 8 minutes. Cool on the counter, then refrigerate for at least 4 hours. Once ready to serve, beat the cream and powdered sugar together until you get stiff peaks. Top the pie with the whipped cream and serve. 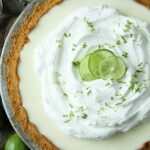 This pie is much better using freshly squeezed key lime juice. However, regular limes or even bottled key lime juice will work.